What is an anthology? The term comes from two Greek words meaning ‘flower’ and ‘collection’. Anthologies, then, are collections of what their editors think are the best examples of a particular art form, whether they are love poems, paintings of animals or great speeches. Since terms like ‘best’ and ‘greatest’ are highly subjective, especially when applied to literary works, an editor’s choice is never going to please everyone. There is always a tension, too, between what readers might expect to find in a particular anthology and its editor’s wish to not just repeat the obvious, but add a few surprises. For its editors, work on the Macquarie PEN Anthology of Australian Literature was especially complicated because of the size of the undertaking. Our ‘flowers’ had to be selected from what had been written in or about Australia, or by Australians, from the arrival of the English language in 1788 through to the early 2000s. And although the term ‘literature’ appears in the anthology’s title, we were planning to include all types of writing. Not just so-called ‘creative writing’ – fiction, poetry and drama – but songs and speeches, letters and petitions – many written by people who, at the time, wouldn’t have thought of themselves as ‘authors’, particularly women and Aboriginal people. The wide range of the anthology created problems for some reviewers, who were faced with material that did not equate to ‘literature’ in their view. Perhaps it would have been better to make a further break with tradition, and call the anthology a collection of Australian writing. The general editor, Nick Jose, refers in his introduction to two previous attempts to put together anthologies of Australian literature, The Oxford Anthology of Australian Literature(Oxford University Press, 1985) and The Macmillan Anthology of Australian Literature(Macmillan, 1990). At around six hundred pages in length, each of these was much shorter than the Macquarie PEN, which runs to just over 1,460 pages. While we had to cover new writing from the 1990s and early 2000s, the main reason for the great increase in length was our expanded definition of ‘literature’. The Oxford Anthology had an emphasis on poetry and fiction but did not include drama. Some non-fiction was represented, especially from the nineteenth and early twentieth centuries, as well as some critical essays on Australian literature. However, nothing written by an Aboriginal Australian was included, even though Oodgeroo Noonuccal’s groundbreaking collection of poems, We Are Going (Jacaranda Press, 1964), had been published twenty years earlier. The Macmillan Anthology, however, included poems by Oodgeroo and Kevin Gilbert, extracts from plays by Jack Davis and Gerry Bostock, and prose by Sally Morgan and others. There were also extracts from some traditional Aboriginal song cycles, collected and translated into English by anthropologists; whereas Anita Heiss and Peter Minter – editors of the Aboriginal Literature section of the Macquarie PEN Anthology – decided not to include any material that wasn’t originally written in English. The editors of The Macmillan also chose to arrange the anthology’s contents thematically rather than by authors’ dates of birth – as in the earlierOxford Anthology – and were at pains to point out that their arrangement was only one of a number of possible ways of organising the contents. In addition, they were concerned with rejecting any notion of assembling a ‘canon’ of either works or authors. This was all happening at a time when hierarchical concepts of literature as primarily the work of ‘dead, white males’ were being challenged by postmodern, postcolonial and feminist critics. The twelve thematic sections of The Macmillan Anthology included ‘The Migrant Experience’, ‘Cultural Politics’ and ‘Women Writers’, as well as ‘Living in Aboriginal Australia’. 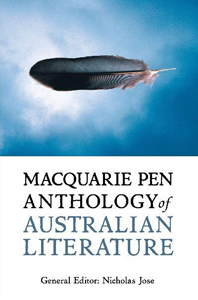 Since the Macquarie PEN Anthology used such an inclusive definition of ‘literature’, there was no need for a thematic arrangement to subvert notions of a canon, and the chosen selections are arranged by their author’s birth date. This is not always ideal, since works by authors who happened to be born around the same time but actually wrote at widely different times are found alongside each other. So, for example, William Barak’s ‘Letter to the Editor’ from 1882, complaining about conditions on the Coranderrk Aboriginal reserve, appears before an extract from Catherine Helen Spence’s novel Clara Morrison (JW Parker and son), published in 1854 (see p. 112–14). With anonymous works such as convict ballads, the initial decision was to order them by date of publication. I objected, since it would have been very odd to find ‘A Convict’s Tour to Hell’, which was not published until 1979, appearing alongside work written over a century later rather than with other material from the pre-1850 convict period. In this and other similar cases, the works were grouped according to assumed date of writing with the date of first publication also given. Even though the word limits allocated to editors were generous compared to those of the earlier anthologies, our initial selections were all over length and had to be severely pruned. There were many long and passionate discussions at editorial meetings about which authors could go and who had to stay. Kerryn Goldsworth, dealing with a period of vast expansion in publication of both fiction and drama (1950 to the near present), had to make some particularly hard choices. And, since fiction has the highest profile of Australian literary genres, the absence of certain novelists was immediately pounced on by reviewers. In hindsight, there should have been room for David Ireland, one of the few novelists to have won the Miles Franklin Award three times. And there should have been room for Ruth Park, a much-loved author of novels, children’s books and an excellent autobiography. Unfortunately, at the time we were all focused on what needed to be cut, rather than added. Although our anthology was much more inclusive than earlier ones, some genres still got rather short shrift. Children’s literature was one of them, making up only four out of our 519 items (though there was none in the two earlier anthologies). There was also criticism of the small amount of drama included, of which there were extracts from ten plays, mostly contemporary. Although I had been teaching them for years at Sydney University, I decided not to include any extracts from plays written before 1900. These were mainly highly popular melodramas that did not read well on the page, since they depended on the physicality of performance even more than recent plays. Initially, there was talk of including film scripts but, as they are also hard to extract in any meaningful way, this proved too difficult. We also argued about the pros and cons of including extracts from novels; of course, we often had to, though wherever possible we chose a short story to represent an author’s fiction. Like the earlier anthologies, The Macquarie PEN includes a lot of poems, which make up more than half of its individual items. Because poems are usually short, it is of course much easier to offer a representative selection of a poet’s work than of a novelist’s. With Banjo Paterson, for example, it was obvious that I needed to include ‘The Man from Snowy River’ and ‘Waltzing Matilda’. The obvious other choice would have been ‘Clancy of the Overflow’ but, as that is a poem I have never much liked, I decided instead to include one of Paterson’s many comic poems, ‘Mulga Bill’s Bicycle’, which shows a bushman’s attempts to come to grips with new technology. With the first significant colonial poet, Charles Harpur, I wished to represent the range of his work, rather than just choosing the usual anthology piece, his long poem ‘The Creek of the Four Graves’. Instead, I included two of his love poems, one of his nature poems and one of his many satires. ‘The Beautiful Squatter’ not only has fun at the expense of the wealthy pastoralists, but also draws attention to their sexual exploitation of Aboriginal women – something rarely discussed when it was first published in 1845. Although the anthology was not going to be arranged thematically, we were also conscious of wanting to create links between earlier and later works. In my case, this meant including an extract from Ned Kelly’s ‘Jerilderie Letter’, which can be compared not only with Peter Carey’s much later version of Kelly’s voice in True History of the Kelly Gang (UQP, 2000) but with the narrative voice used in Rolf Boldrewood’s Robbery Under Arms (Remington & Co, 1888), published soon after Kelly’s death in 1880 though well before anyone knew about his unpublished letter. Kelly quotes in his letter from the convict ballad ‘Moreton Bay’, so creating another link. His reference to ‘Port McQuarie, Toweringabbie, Norfolk Island and Emu plains’ (p. 225) recalls the third stanza of the ballad’s account of places of punishment (p. 90). Another version of the Ned Kelly story can be found in David Campbell’s poetic sequenceKelly Country. Stanza 4 of the final poem in Kelly Country quotes Kelly’s ‘dying words’: ‘Such is life!’ This is also the title of Joseph Furphy’s famous novel about life in the bush (see p. 155–63), though Furphy may not have intended any reference here to Kelly. That the expression was a common one at the time is indicated by its recurrence as the final words of Ada Cambridge’s story ‘The Wind of Destiny’, published in 1897 when Furphy was finishing the first version of his novel. Cambridge’s ironic anti-romance is set in Melbourne, and deals with people wealthy enough to own yachts. It is remote both socially and geographically from Furphy’s bush, with its bullock drivers and selectors. In addition to showing us very different aspects of Australian life at the end of the nineteenth century, the two authors are both concerned with questioning the conventions of romance, in the interest of a more realistic depiction of life. Among the poems, there are a number either entitled ‘Australia’ or similarly focused on national representation, like Caroline Carleton’s ‘The Song of Australia’ from 1858. It remains popular in her home state of South Australia, where it came first in a national plebiscite held in 1977 to choose an Australian national song. But nationally it came last; ‘Advance Australia Fair’ was preferred by almost fifty per cent of voters, followed by ‘Walzing Matilda’, and ‘God Save the Queen’. Today, ‘The Song of Australia’ reads as a very British anthem, with its references to roses and to Australia as ‘Fairest of Britain’s daughters fair’, especially as the ‘proud flag’ that waves in the last stanza would in 1858 have been the Union Jack. Conversely, Dorothea Mackellar’s better-known ‘My Country’ begins with a deliberate contrast between the soft green landscape of Britain and Australia’s ‘wide brown land’. And, unlike Carleton, she refers to negative features such as ‘flood and fire and famine’ – to ‘terror’ as well as ‘beauty’. In his sonnet ‘Australia’, written in 1900 when the country was about to become a political as well as a physical entity, Bernard O’Dowd speculated on possible negative and positive futures. Like Mackellar’s, his poem works through contrast, asking whether Australia will end up repeating the mistakes of older nations, or whether it will forge a new path for mankind. For much of his 1939 poem, also called ‘Australia’, AD Hope seems to endorse the negative view, referring to Australians as ‘second-hand Europeans’ and comparing Australia itself to a post-menopausal woman. Yet there is a marked reversal in the last two stanzas, where ‘the chatter of cultured apes’ is rejected in favour of the desert and its prophets. For me, however, the negative images of this poem remain much stronger than the positive ones. Many other views of Australia can be found throughout the anthology. Among them are Barry Humphries’ comic suburban version of ‘My Country’ entitled ‘Edna’s Hymn’; Ania Walwicz’s prose poem ‘Australia’, written from the perspective of a recent migrant; and Peter Goldsworthy’s vision from outer space, also called ‘Australia’. Like the earlier poems discussed here, each reflects the ideas, language and style of the time in which it was written as well as the personal beliefs and experiences of its author. These are just some of the thematic links that can be found between individual items in the anthology. It is possible, for example, to follow threads relating to specific events such as the world wars, ANZAC Day and the Eureka Stockade. Descriptions of life in the bush, cities and suburbs, by authors from many backgrounds and written at various times, can be compared and contrasted. In particular, there are many different perspectives on the colonisation of Australia and the continuing impact of this on Aboriginal people. As one of the editors I hope there is also much for readers to enjoy, as well as a few surprises. Austlit, an online database of Australian literature. Pierce, P (ed.) 2009, The Cambridge History of Australian Literature, Cambridge University Press, Cambridge. Webby, E (ed.) 2000, The Cambridge Companion to Australian Literature, Cambridge University Press, Cambridge. ELIZABETH WEBBY AM is Emeritus Professor of Australian Literature at the University of Sydney. Her publications include Early Australian Poetry (Hale & Iremonger, 1982), Colonial Voices (UQP, 1989), Modern Australian Plays (Sydney University Press, 1990), The Cambridge Companion to Australian Literature (Cambridge University Press, 2000) and, as joint editor, Happy Endings (Allen & Unwin, 1987), Goodbye to Romance (Allen & Unwin, 1989), The Penguin Book of Australian Ballads (Penguin, 1993) and The Macquarie PEN Anthology of Australian Literature (Allen & Unwin, 2009).